Visiting the clubhouse for the first time. I can only imagine that fans and workers alike were wondering what was to happen to Studio Ghibli now that Miyazaki Hayao has stepped down (This is where I say, “Damn you world for not loving Takahata Isao as much as you loved Miyazaki!” Case in point: Grave of the Fireflies). We see that Miyazaki’s son, Miyazaki Goro, has taken up his father’s mantle at helming movies for Studio Ghibli. From Up on Poppy Hill (コクリコ坂から Kokuriko-zaka Kara) follows Matsuzaki Umi, a student who works in a boarding house, as she helps the boys at her school save their clubhouse, which is in imminent danger of demolition to make way for projects relating to the 1964 Olympics. As she works, she comes to learn about herself, as well as classmate Kazama Shun. Stylistically, I would say that Miyazaki Hayao (despite the fact that he cowrote this movie) and Miyazaki Goro or the animated analogues to Kurosawa Akira and Ozu Yasujiro; While the former tended to make more grandiose movies, the latter opted for quiter, understated ones. From Up on Poppy Hill is the first Ghibli production I have seen (barring Grave of the Fireflies) where there wasn’t any fantasy elements. It was a love story very firmly grounded in reality. Despite that, Umi and Shun had a relationship that was great to watch. I think the best part of most Japanese movies is their depictions of interpersonal relationships, and From Up on Poppy Hill was definitely no exception to that. The often tense moments between the two high school students also saved From Up on Poppy Hill from descending into the territory of Real Life of a Middle School Girl: The Anime. 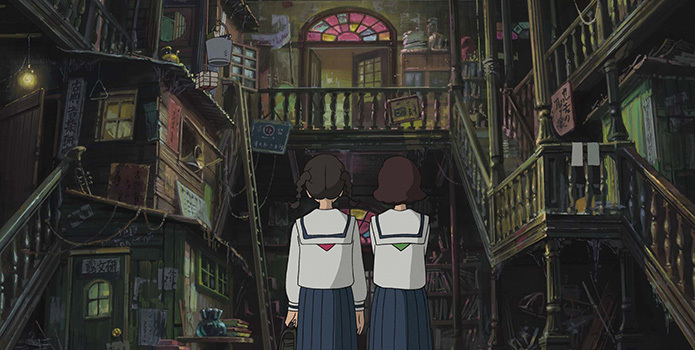 Even with tensions, From Up on Poppy Hill was consistently a feel-good movie. It had its fair share of laugh-out-loud moments. The characters were easy to relate to, and thus the audience I was with had no trouble cheering them on. One thing I really praise Miyazaki with is his recreation of Japan in the early 1960s. Tokyo, as it was before the “clean up” that went with the 1964 Olympics, was nice and dirty, and Miyazaki did a great job of showing that. Not only that, but much of the movie’s soundtrack sounded like classic J-pop from the 1960s. My favorite song, by and far, was Teshima Aoi’s “Summer of Farewells – From Up on Poppy Hill”, though I did like the fact that 1961’s “I Shall Walk Looking Up” by Sakamoto Kyu made the soundtrack as well. Interestingly enough, we have a Ghibli production that was scored by Takebe Satoshi. That is to say, it was not scored by Joe Hisaishi. Partly because the movie has a few dents in pacing, partly because I wasn’t a fan of some of the animation being pretty obviously CG (I always preferred the purely handdrawn animation from older Ghibli movies), and partly because I felt at times Miyazaki Goro was trying a little too hard to emulate his father’s style, I am not about to say that From Up on Poppy Hill is my favorite Ghibli picture; that badge is still currently (and proudly) warn by Kiki’s Delivery Service. However, From Up on Poppy Hill is a rare instance of being a movie that I actually want to see again. Great review. I really enjoyed this movie too but you’re right, the pacing wasn’t ideal. Having said that, when I saw this movie I had a really stressful time getting to the cinema and I had to run from the tube station to make the opening credits. It was quite nice watching something slow after that. Have you seen ‘Whisper of the Heart’ yet? That’s another great Ghibli movie that doesn’t really have fantastical elements to it. I actually haven’t seen that one! I think I might see that one since I’ve almost felt like with the exception of Howl’s Moving Castle, I have seen just about every Ghibli movie worth seeing. I personally tended to prefer “classic” (i.e. pre-Princess Mononoke) Ghibli movies over their newer stuff. As I said in my review, among other things, I preferred it when the animation was done completely by hand instead of with the aid of computer graphics.